AliExpress cancels orders if they think the orders are fake. AliExpress does not know you are dropshipping, therefore, shipping orders to customers in different locations can be a red flag, which means the order could be cancelled automatically. The steps below may help you to avoid the orders being closed. 1. Click on the orange "Order Products" button to start the ordering process. 2. Wait until the Oberlo Chrome Extension completes its job. 3. Select the preferred shipping option. 4. Choose the "Other payment methods" option and click "Confirm & Pay". 5. From the newly opened page, click "Cancel payment and return to AliExpress". 6. 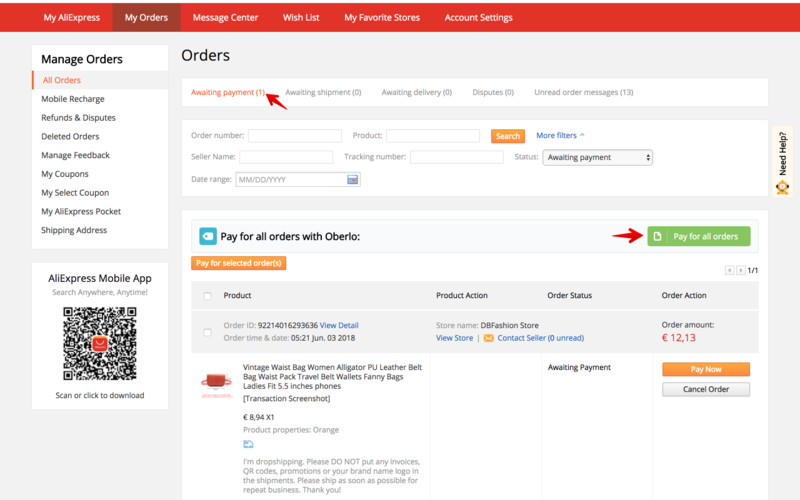 Go back to Oberlo, and place other orders following the same steps. 7. Finally, once you want to pay for several orders, go to the "Awaiting payment" section and click on the "Pay for all orders" button. 8. From the newly opened page, fill in your payment card details to complete the purchase. If your order gets closed, you will need to follow AliExpress regulations and provide with all needed documents. We would highly recommend having a look at this article to learn more how to handle closed orders.